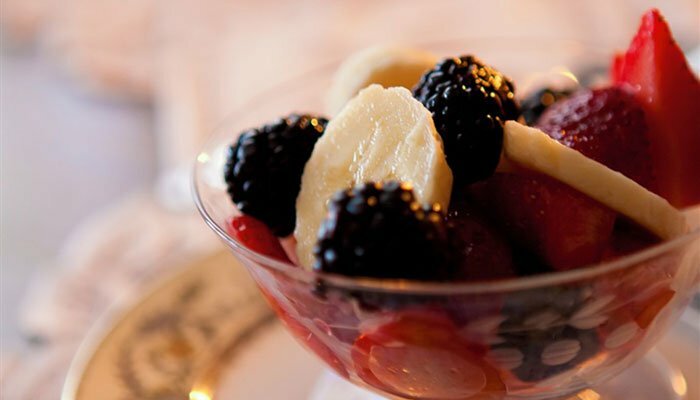 The morning begins with a choice of Harney & Son's Quality Teas, Stone Creek coffee, or juice and is followed by an elegant, full four-course breakfast, including a decadent dessert. The breakfasts are selected from our homemade family-favorite recipes. Fresh herbs and fruits from the Inn's garden, enhances the flavor of each and every course. 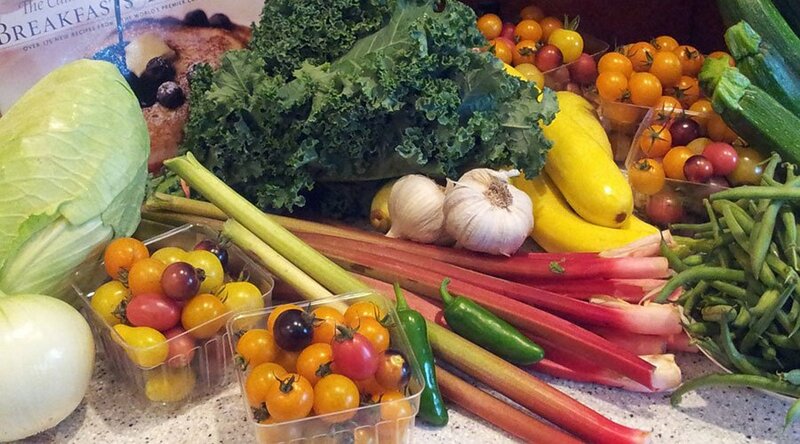 "Farm to Table", Locally handpicked Farm fresh produce, is part of every breakfast, during the Summer & Fall seasons. Attention to detail and presentation can be experienced by all who stay. Enjoy your breakfast in a sun-drenched formal dining room, at an antique table for six or at a private table for two. The original architectural features, including carved plaster ceilings, natural oak woodwork, period antiques and historic heirlooms, create a rich morning dining experience. During the warm summer months breakfast may even be served on the outdoor, front porch, overlooking the 1917 restored fountain and fragrant garden beds. We offer flexible breakfast times to fit any schedule. Special attention is considered for those guests with specials dietary needs such as Dairy Free, Gluten Free, Vegan, Vegetarian, low sugar or low carb, Lactose Intolerant and etc. ; when planning the daily menus. 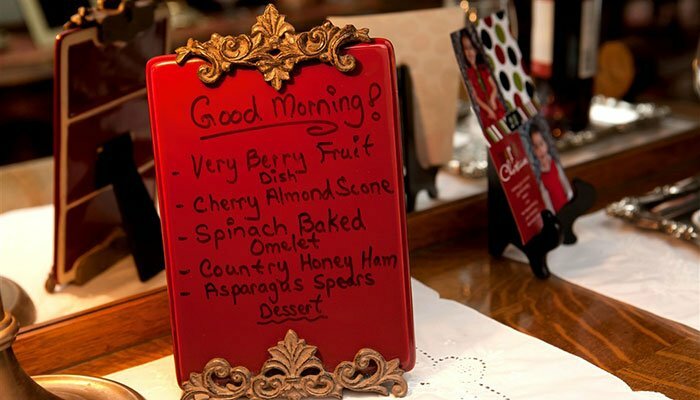 When making a reservation, simply inform the innkeepers if they need to make dietary changes to meet your needs. For those guests who have early flights or early departures (before 7:00 am); Innkeepers can provide a travel cup of coffee or tea, piece of fresh fruit and a muffin or scone "To Go" All you have to do, is ask. The Sunrise Breakfast Basket to Go is available for guests staying at the Inn for two or more nights, who have very early "Touring/Sight Seeing" plans for the day. Inquire when making reservations. The pleasant aroma of fresh Homemade Baked Cookies fills the Inn in the early evening for all to enjoy! 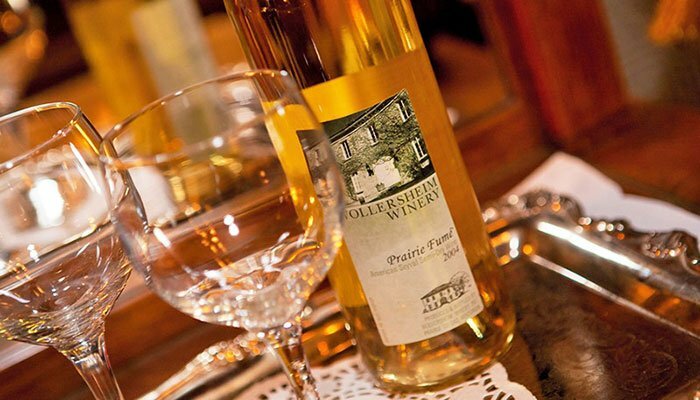 Complimentary "Wine & Cheese Social Hour" is available daily from 4:00-5:00pm.